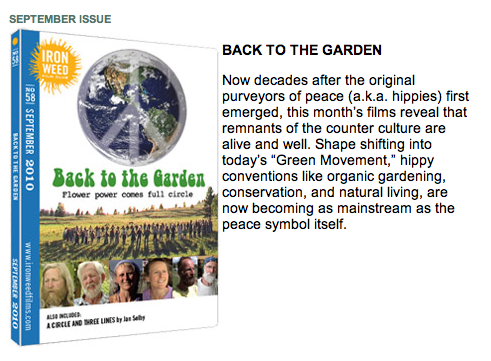 back to the garden... flower power comes full circle: Ironweed Films makes "Garden" its September Film of the Month! 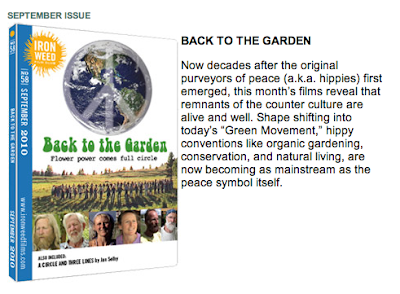 Ironweed Films makes "Garden" its September Film of the Month! We're so stoked that Ironweed Films of Oxnard, CA. has chosen our film as their Film of the Month for September! This is a passionate, progressive, socially-responsible group of film lovers who know that many folks will never see Independent docs outside the film festival circuit. To bridge this gap, they offer a provocative film festival on DVD every month.